One year ago, Haley's mother disappeared without a trace while on a trip to Iceland with Haley’s geologist father. Impatient with her father's seeming willingness to give up on the search, Haley compels him to take her to Iceland, where she plans to launch her own search. But she's not there long when she learns a secret that makes her question everything she thought she knew about the circumstances of her mother's disappearance, and is sent on a dangerous magical exploration with a boy named Ari, toying with a spell that spans generations and a power that could destroy the world. Thief Eyes is an intriguing and detailed novel that combines magic, romance and the actual myths and legends of Iceland to create a very accessible tale that teen readers will enjoy and even learn from. There are many elements of Nordic legends, combined with the family drama that Haley and her father must work through, in Thief Eyes to make this novel busy and appealing, and the pages go by quickly. At times it does seem as though Simner moves a little too quickly for readers to keep up, and the introduction of the mythical beings is sudden and a tad bit unexpected. 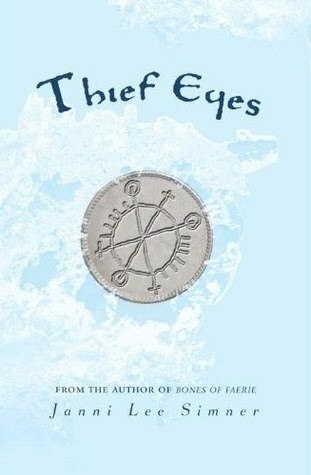 Still, Thief Eyes is a unique and absorbing novel that might remind readers of Ice by Sarah Beth Durst, and combines the appeal of centuries old legends and the practical issues and problems of life now to make a dramatic and entertaining novel. Cover Comments: This is a really pretty cover--I like how the blue and white looks like snow and ice, and besides looking really cool, the coin on the cover is also significant in the story. Very cool!